One of the most touching moments of this trip was when the Charlotte medical team, led by Dr. Will Conner, first visited the home of 4-year-old Jacky Delva and his mother, Chella Michel. They live with Nadége Pierre and her three children Jovanny, 13, Christopher, 7, and Oliver, 2. 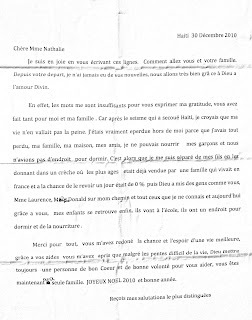 On the eve of the January 12, 2010 earthquake, Pierre tearfully read by candlelight a letter that she had written to Natalie Conner. If it wasn’t for Natalie, who with her husband are helping support the two single-mothers as well as paying for their childrens’ education, Pierre said they would be living on the street. The letter is posted below. Here are a few roughly translated excerpts. “After the earthquake that devastated Haiti, I believed that my life was not worth living. I had truly lost my mind because I had lost my family, my house, my friends. I could not fee my children. And we did not have a place to live." "… Thanks to people like you Madam Laurence and Donald, you have put me back on my way. You have given me another chance and hope for a better life…"
"…Thanks to your help. You have taught me that despite the difficult times of life that God will always put a person of good heart and good will to help you." In September, Jacky and Michel moved in with Pierre and her three children, Jovanny, 13, Christopher, 7, and Oliver, 2. Jovanny was another one of Conner’s former patients at Sacre Coeur Hospital where a Charlotte team worked in February. For seven months, Nadége Pierre, 33, had no idea her daughter was alive, and even held a funeral. It was until after the Jovanny’s remembrance ceremony when Laurence Desvignes, who was then with the International Committee of the Red Cross met Jovanny, who had suffered a brain injury, at Sacre Coeur. Desvignes eventually tracked down Nadege Pierre in Port-au-Prince and brought her to the north to reunite with her daughter. Natalie Conner and Desvignes, who also met at Sacre Coeur, worked together to help find the two displaced families housing in Cap-Haitien. And with the help of Donald Chaudry, the Conners’ guide and closest friend in Haiti, the Conners have continued to support Pierre and Michel’s families. Photo: Nadege(right), Christopher, 7, and Oliver, 2 as well as Jacky, 4, his cousin, and their neighbor wave goodbye to the Charlotte medical team. Franco Ordoñez writes about immigration (and Haiti) for the Charlotte Observer. This Land covers the latest news and ideas about one of the country’s most perplexing issues of our day. Email him at fordonez@charlotteobserver.com. Charlotte connections continue to grow in Haiti.